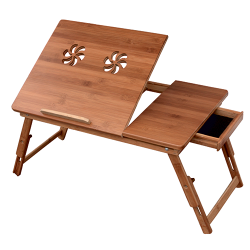 Adjustable Multi - Functional Wooden Bed Tray. Containing a useful drawer for your bits and pieces, this bed tray also has a removable book rest, and can be folded down for easy storage. Made from sustainable eco-friendly bamboo. Suitable for eating, drinking, reading, writing and craftwork. This bed tray is specially suitable for use with laptops as it has ventilation to the surface. A useful drawer for bits and pieces. One multi-angle table top - 4 angle adjustments. Made from sustainable eco friendly bamboo.